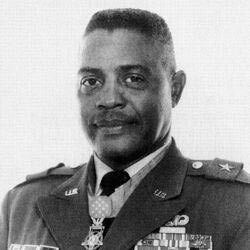 September 6, 1929 Charles Calvin Rogers, Medal of Honor recipient, was born in Claremont, West Virginia. Rogers joined the United States Army and by 1968 was serving as a lieutenant colonel in command of 1st Battalion, 5th Field Artillery Regiment, 1st Infantry Division during the Vietnam War. On November 1, 1968, his battalion was manning a fire support base near the Cambodian border when it came under heavy attack. Rogers’ actions during the attack earned him the medal, America’s highest military decoration. His citation partially reads: “In the early morning hours, the fire support base was subjected to a concentrated bombardment of heavy mortar, rocket and rocket propelled grenade fire. Simultaneously the position was struck by a human wave ground assault, led by sappers who breached the defensive barriers with bangalore torpedoes and penetrated the defensive perimeter. Lt. Col. Rogers with complete disregard for his safety moved through the hail of fragments from bursting enemy rounds to the embattled area. He aggressively rallied the dazed artillery crewmen to man their howitzers and he directed their fire on the assaulting enemy. Although knocked to the ground and wounded by an exploding round, Lt. Col. Rogers sprang to his feet and led a small counterattack force against an enemy element that had penetrated the howitzer positions. Although painfully wounded a second time during the assault, Lt. Col. Rogers pressed the attack killing several of the enemy and driving the remainder from the positions. Refusing medical treatment, Lt. Col. Rogers reestablished and reinforced the defensive positions. As a second human wave attack was launched against another sector of the perimeter, Lt. Col. Rogers directed artillery fire on the assaulting enemy and led a second counterattack against the enemy forces. His valorous example rallied the beleaguered defenders to repulse and defeat the enemy onslaught. Lt. Col. Rogers moved from position to position through the heavy enemy fire, giving encouragement and direction to his men. At dawn the determined enemy launched a third assault against the fire base in an attempt to overrun the position. Lt. Col. Rogers moved to the threatened area and directed lethal fire on the enemy forces. Seeing a howitzer inoperative due to casualties, Lt. Col. Rogers joined the surviving members of the crew to return the howitzer to action. While directing the position defense, Lt. Col. Rogers was seriously wounded by fragments from a heavy mortar round which exploded on the parapet of the gun position. Although too severely wounded to physically lead the defenders, Lt. Col. Rogers continued to give encouragement and direction to his men in the defeating and repelling of the enemy attack.” On May 14, 1970, President Richard M. Nixon presented the medal to Rogers. Rogers rose to the rank of major general before leaving the army. He later became a Baptist minister serving U. S. troops in Germany where he died on September 21, 1990.